The people of Gaul (modern-day France) did not know what they were getting into when they asked Rome for help. Some of the Gallic tribes were official Roman allies, so Caesar was obligated to come to their assistance when they asked for help against the incursions of stronger, Germanic tribes from across the Rhine. The Gauls realized too late that Rome's help had come at an exorbitant cost and that they might have been better off with the Germans who later fought for the Romans against them. The Battle of Bibracte in 58 B.C. was won by the Romans under Julius Caesar and lost by the Helvetii under Orgetorix. This was the second major battle known in the Gallic Wars. Caesar said that 130,000 Helvetii people and allies had escaped the battle though only 11,000 were found to have come home. The Battle of Vosges in 58 B.C. was won by the Romans under Julius Caesar and lost by the Germans under Ariovistus. Also known as the Battle of Trippstadt, this was the third major battle of the Gallic Wars where Germanic tribes had crossed the Rhine in hopes of having Gaul be their new home. The Battle of the Sabis in 57 B.C. was won by the Romans under Julius Caesar and lost by the Nervii. This battle was also referred to as the Battle of the Sambre. It ​occurred between the legions of the Roman Republic and is known today as the modern river Selle in the north of France. The Battle of Morbihan Gulf in 56 B.C. was won by the Romans' naval fleet under D. Junius Brutus and was lost by the Veneti. Caesar considered the Veneti rebels and punished them severely. This was the first naval battle that was historically recorded. In 54 B.C. the Eburones under Ambiorix wiped out the Roman legions under Cotta and Sabinus. This was the Romans' first major defeat in Gaul. They then besieged the troops under legate Quintus Cicero's command. When Caesar got the word, he came to help and defeated the Eburones. Troops under Roman legate Labienus defeated the Treveri troops under Indutiomarus. A series of military campaigns, the Gallic Wars (also known as the Gallic Revolts) resulted in decisive Roman victory in Gaul, Germania, and Britannia. The Battle at Gergovia in 52 B.C. was won by the Gauls under Vercingetorix and lost by the Romans under Julius Caesar in south-central Gaul. This was the only big setback that Caesar's army was subjected to during the full Gallic War. The Battle at Lutetia Parisiorum in 52 B.C. was won by the Romans under Labienus and lost by the Gauls under Camulogenus. In 360 AD, Lutetia was named Paris from the tribe name "Parisii" derived from the Gallic Wars. The Battle of Alesia, also known as the Siege of Alesia, of 52 B.C was won by the Romans under Julius Caesar and lost by the Gauls under Vercingetorix. This was the last major battle between the Gauls and the Romans and is viewed as a large military achievement for Caesar. 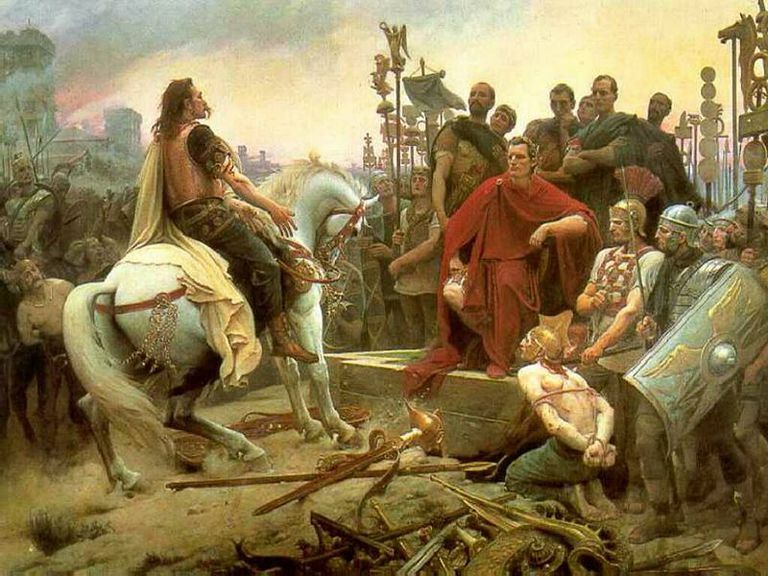 Why Did Caesar Write About the Wars Between Rome and Gaul?